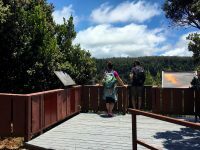 Hawaii National Park, HI – The Pu‘u Pua‘i Overlook has reopened after being closed since February to protect breeding nēnē (endangered Hawaiian geese) in the area. 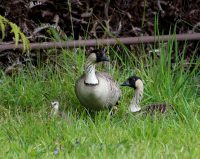 During the closure, the nēnē parents successfully raised their single gosling and the family has now moved on to their summer grounds. 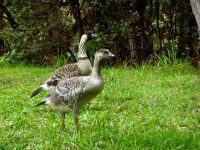 It’s been a decade since the last gosling was reared in the vicinity, and that nēnē is the grandfather of this year’s gosling, according to Kathleen Misajon, wildlife biologist at Hawai‘i Volcanoes National Park. “This year’s gosling was the fifth generation of the same nēnē family I’ve monitored over the years. After a 10-year hiatus, it is really exciting to see this female return to a favored family spot,” Misajon said. In 1952, only 30 nēnē remained statewide. In the 1970s, Hawai‘i Volcanoes National Park began efforts to save the species from extinction. Today, more than 250 wild birds thrive in the park from sea level to around 8,000 feet. There are more than 2,500 nēnē statewide. 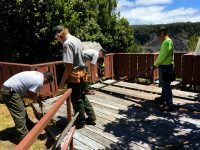 During the closure, the park’s facilities maintenance team made improvements to the popular deck, which overlooks Kīlauea Iki crater and trail. Missing boards were replaced, and the deck was painted prior to the reopening.